My goal is for all of my fourth graders to be able to write a thoughtful, detailed response to higher order questions about what they read. It's a long road. Each student brings different kinds of thinking to the task. Some just dash off any old answer, while others retell the story in response to every prompt. Still others can start a good answer, but don't make the connections between their text details and their answers. Many students don't have much experience with academic discourse. Cohesive phrases like "for example", "as a result", and "in addition" are just not in their expressive vocabularies. I can see them struggling with their words, trying to express ideas without access to these phrases. Their task is made much harder! Paul Bunyan had a rough childhood. For example, he was left in a cave. He was put in a giant cradle. Also, he cried for thirty days and nights. I wouldn't want a childhood like that! After we wrote the response, we read it aloud together. Sometimes I have students copy it as well. (I'm careful with this, though, as I don't want the task to become tedious drudgery) Through repeated exposures, students start to internalize the connectors and make their writing more connected. I'll be presenting on Wednesday at KSRA. The title of the presentation is "Teaching Text Structure: A Deeper Look". Basically, I'll explain how to go beyond just helping kids to identify text structures, and into using the text structures to inform comprehension. Hmm, presenting on the last day of the conference, after all of the exhibits are closed. I'm not sure of how many to expect. To save paper and ensure that I am not stuck with zillions of unused copies, I'm posting the Powerpoint and handouts here. Text Structure Card Match Activity: This will get kids up and around to match text structures and questions to ask of them. View more presentations from Emily Kissner. This week we've been working on details that are general and specific. All too often, kids are told to add "specific" details...when they don't really know what this means! The next day, I used the linear array idea to help students organize ideas from general to specific. Students received index cards with one of the following: a place, a place in Pennsylvania, a park in Pennsylvania, Kings Gap State Park. After I handed out the index cards, students came to the front to arrange themselves in order from general to specific. Of course, a place was the most general! We talked about how this doesn't put a clear picture in the reader's mind. On the other end, Kings Gap State Park was the most specific, because it refers to a specific place. Other cards I used: a thing, a living thing, an animal, a cold-blooded animal, a frog, a leopard frog. This one generated some discussion, as students often put "cold-blooded animal" as more specific than "leopard frog". Interesting. The big idea here is to show students that there are shades of gray between general and specific, and that ideas can get more and more specific. Next week, we're going to write to describe photos with nouns, adjectives, and verbs, trying to be as specific as we can. I guess the test of this lesson came when I was trying to tell a student where the tape was. I don't know why, but the tape in my classroom is always wandering about. "Um--I think it's on the thing at the front of the room," I told a student. She looked at me, sighed, and said, "Mrs. Kissner, I think that was a little too general." One of my favorite books is The Teacher's Funeral by Richard Peck. However, after introducing it to several students, who promptly put it right back on the shelf, I realized that many students lack the background knowledge they need to make it through this book. To develop their background knowledge about schoolhouses, I wrote this book, Schoolhouses of Long Ago. (I did the illustrations too--it was a fun Sunday project. My boys were doing watercolors, I was sketching pictures, and we were all working together.) It's formatted to copy double-sided. I wanted the headings and captions to be functional, so that I could use this to teach conventions of nonfiction. It was a Friday afternoon. A quarter of my class was missing, with some sick and some at a pullout program. I didn't want to move on with too much new content, and didn't have quite enough time to get in a guided reading group before our computer lab time. So I decided to go ahead with something that I'd been considering for awhile. Over the summer, I went with my youngest son to see a children's theatre performance. The entire show was improvisational, and they ended with "60 Second Theatre"--trying to retell a fairy tale in decreasing lengths of time. I thought that this might work to help students recognize the important and less important ideas in a story. We had just read a 2-page version of "The Princess and the Pea", and had organized and sorted cards that I had made with the events on them. Students knew this story inside and out. "I need a princess, a queen, and a prince," I said, and the kids eagerly raised their hands to participate. Then, I explained what we would be doing--trying to retell the whole story in the least amount of time. "As we do this, it's important to consider only the important events in the story." This whole activity was so successful that I'm going to move it into heavy rotation--not just something that I do when part of my class is missing, but something that I use for real instruction. There was so much richness here, with the acting, the narrating, and the discussion of which events were most important. Give it a try! In my first year of teaching, I went to hear Barry Lane speak about teaching writing. In every year since then, the language of After the End and the Reviser's Toolbox have been a part of my classroom. Snapshots, thoughtshots, scenes, magic binoculars...across grade levels, schools, and state lines, I've used them every year. Today, as we worked on the Ideas Trait, I introduced my students to the magic binoculars. Using the focus adjustment on the LCD projector, I showed them that bland writing is fuzzy writing, just as blurry as the image they saw. If I just wrote, "This is a praying mantis," I wouldn't have very good writing. Then I focused the image (it's always gratifying to hear students gasp in appreciation as the scene becomes clear!) "Writers, I'd like you to try to use your magic binoculars to write some great details about the praying mantis. What can you say that will help readers to picture it?" Hands went up. Before they started writing, they wanted me to answer some questions. (Wow! This was great!) Was I the one who took the picture? Where was it? What was the praying mantis looking at? Did I know what kind it was? I put the answers to the questions on the dry erase board, adding a few words that they might want to use as spelling references, like "praying mantis" and "insect". In one class, I had enough time for students to look at another picture and write details; in another class, we wrapped things up here. What's so great about this lesson? Everyone wrote. Everyone shared. Everyone received feedback about their work. There were no papers to grade. And it only took 20 minutes. Some of the students had problems with the handwriting or spelling of the other writers. Today, I read those pieces aloud to the students. The main focus of the lesson was ideas, and I didn't want to pull the students away from that focus. Tomorrow, though, I'm going to weave that piece in. "Writers, some students felt disappointed yesterday when they had trouble reading what was on the page. What can you do to make it easier for your reader to see your ideas?" A writing lesson doesn't always have to lead to a polished final project. Sometimes, good writing is born in the small moments, the little experiences of crafting details and responding as a writer. Anthony Wayne article: This article, suitable for readers in grades 6-8, gives a brief biography of Anthony Wayne. Chinese Etiquette article: Written as an example of compare/contrast text structure, this article includes multiple choice questions and a short answer response. Text structure lesson for science: A lesson plan from Utah about using text structures in science class. The Clarifying Routine: From LD Online, an article with more strategies for teaching vocabulary. Reading Quest: Although this is written for social studies, teachers in all areas will be able to find resources such as graphic organizers, strategies, and helpful content area reading information. 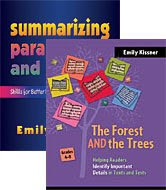 Just Read Now Vocabulary: This resources, from Florida, includes explanations of 12 key vocabulary strategies, including the Frayer model, semantic webbing, Possible Sentences, and word sorting. Enjoy! If you have any links of your own to add, please share them in the "Comments" section. Thanks! This year, I'm really working on helping students to understand some of the key words behind our reading content. I've already talked about giving students a firm knowledge of the words feature and structure. As I started working with guided reading groups, I decided it was time to help students understand the word strategy. How could I do this? Typically, my brain raced through lots of impractical and crazy ideas (a large scale game of Capture the Flag, for example) before I thought of a simple solution: Tic Tac Toe. To get us ready for the discussion, students had to find a partner and sit at desks somewhere in the room. Then, we looked at the definition for strategy--"a plan for achieving a goal". We started out by talking with partners about our strategies in soccer. In soccer, the goal is--well, the goal, which made it very literal and concrete. After we made a list of soccer strategies, we talked about the goal in tic tac toe. What were we trying to accomplish? Of course, getting three in a row. Then, I chose a few students to go against me in a game of tic tac toe on the overhead, talking about our how we could both use a strategy. After I played a few games, students worked with their partners to try out some strategies for tic tac toe. They needed the instant gratification that comes from applying a strategy and seeing it succeed. And it worked! They had quite a few strategies to share--use the middle, distract your opponent, set it up so that you had two opportunities to win--and were able to see pretty quickly the benefit of choosing a strategy. I was amazed at how quickly the lesson on reading strategies went after this experience. What is our goal for reading? It's not to get three in a row (the kids all giggled at this), but to understand the text. What are some strategies that we can use? Suddenly, there were quite a few suggestions. The next day, I had to leave school early to take my two sons to get their flu shots. I left behind a sorting activity that had students match reading strategies to their definitions. When I returned, I found (happily) that pairs of students working together could generate the different reading strategies and explain what they meant. Not bad for a 20 minute activity with a substitute! The richness of their understanding of the word strategy gave them an instant framework for the reading strategies. Of course, there is much work to be done. We need to look at how to use strategies, when to change strategies, and how to see if our strategy use is working. For now, though, I'm pleased that the students have a better understanding of the word strategy than ever before. And I have some killer new tic tac toe moves!